It’s a simple fact of life in the animal kingdom that predators hunt prey. There’s no getting around the roles that each one plays in the food chain.But as we’ve seen time and time again, every once in a while Mother Nature likes to throw a surprise at us. 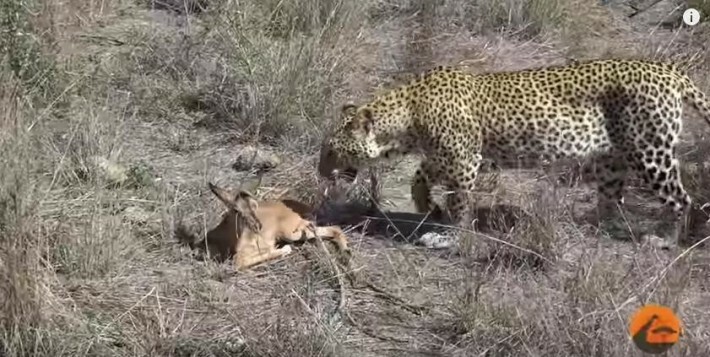 For proof, look no further than the scene that unfolded when this leopard spotted a helpless baby impala.The strange encounter took place in South Africa’s Kruger National Park in front of a group of tourists. They must have expected the worst when this leopard started running towards a baby impala, a species of antelope. Not only did the leopard do nothing to hurt the baby, but he actually started to get pretty friendly with her! Even more amazingly, rather than running away, the impala reciprocated the acts of affection! Watch the unusual scene unfold below!